Retraite Whaleback est un endroit idéal pour une escapade en famille ou un groupe d'amis qui cherchent à profiter d'une visite de vin et toute la beauté et Leland Norther Michigan a à offrir! 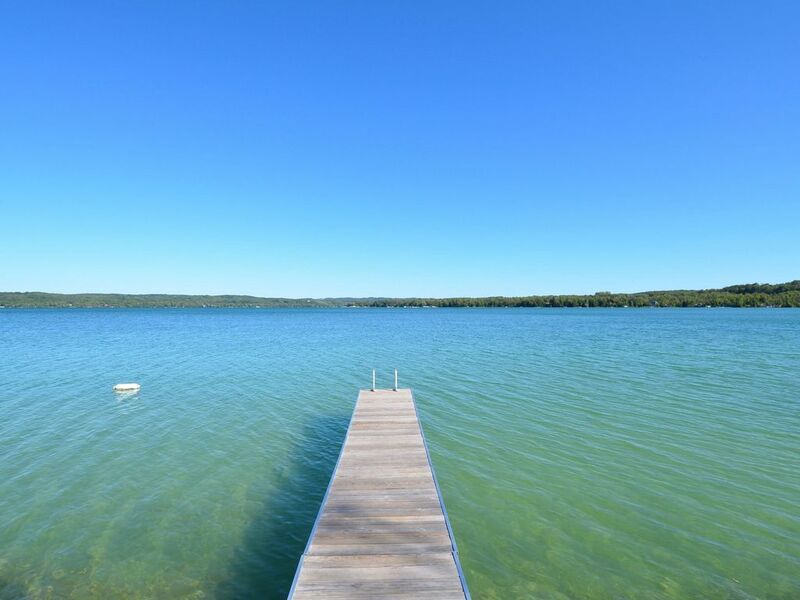 Nous sommes situés sur North Lake Leelanau juste au sud de Leland Village. Cette maison spacieuse avec vue sur le lac depuis Whaleback Hill possède 200 pieds de lac dans la rue! Tout ce que vous avez besoin pour une occasion parfaite pour être ensemble a été bien réfléchi par les propriétaires. La chambre principale à l'étage est une fuite en soi avec son lit confortable king-size, vues boisées pacifiques et salle de bain spacieuse avec douche de plain-pied. Les quatre autres chambres sont joliment décorées et disposent chacune d'un lit queen-size. Trois des chambres ont des balcons avec des sièges et vue sur le lac. La maison dispose d'une cuisine complète sur les deux niveaux qui permettent de beaucoup d'espace pour cuisiner ou permet aux clients de profiter un peu de temps calme séparément. Vue sur le lac sont appréciés de la / cuisine complète salle salon ouvert / à la fois dans l'étage en bas et les zones qui peuvent être fermés hors de la vie privée si nécessaire. Lac Gazing est nécessaire lorsque savourant le café du matin sur l'un des balcons ou terrasses et pendant la cuisson sur le patio. Bien sûr, ce est alors à vous si vous vous dirigez vers les escaliers colline, dans la rue et sauter à droite! Que vous êtes à la hauteur de détente, dégustation de vin sur la plus grande piste de vin du Michigan, randonnée Sleeping Bear Dunes, ski alpin, raquettes, ski de fond ou de motoneige sur la plupart des grands sentiers, canotage Lake Leelanau ou le lac Michigan, la pêche sur glace, sport, regarder l'eau ou flamboyant un vélo sentier de montagne en été, Whaleback Retreat a tout! Cette année, autour escapade sera toujours vous faire sentir à la maison. The cottage was beautiful and very clean! Views from the multiple decks and windows were amazing! We loved the spacious rooms and gorgeous scenery from all the decks and windows! This is my second year coming to this beautiful home. It didn't disappoint. Rebecca is awesome to work with from booking, arrival, and departure. She offers an open line of communication and is very accessible. Her home is truly a home away from home and an oasis. We had 5 couples stay and we were not in each other's way. The home offers space to be apart, yet a cozy meeting space in either living room areas to enjoy each other's company. The scenery is breathtaking and truly a beautiful sight. The home is close to many wineries, trails, and great dining choices. Make sure to stop by Figs on the way in and out!! Had a fabulous time at this rental property. Owner was great to work with and the house had more than enough room for the 8 adults. Property is in a beautiful location with plenty of fishing, restaurants, wineries, breweries & a distillery near by. It is also only about 25 minutes from downtown Traverse City. We highly recommend this property to anyone looking for a beautiful getaway with family or friends. We only stayed a weekend but could have easily stayed a whole week. We were there for a weekend getaway with 4 couples and home was in a perfect location for wine tour along M-22. Deck was perfect place for watching the sunrise. Home was very roomy and gave couples privacy. Would definitely stay here again. I'd like to start with saying how great the owner, Rebecca, is to work with! She was very accommodating and always gave a prompt reply with any questions. Our kids, inadvertently, purchased something on tv and she was very patient about that and removed the charges.The view from the deck is AMAZING, for that matter, all the rooms in the front (lake facing) of the house have a fantastic view! We had beautiful sunrises every morning and this was a popular location for morning coffee. The house was clean and accommodated all of us easily. We rented the entire house with extended family and had kids ranging from 12-4 years of age. The driveway and yard are very spacious. We brought scooters/rollerblades and hockey sticks for them to play roller hockey. There was more than enough space outside for those activities. The house itself has an odd layout. The bedrooms that are in the apartment area share a bathroom just something to keep in mind(I didn't get this impression by the photos) and the shower doesn't have a door or curtain. To get to the master bedroom you need to go through the bathroom which became somewhat inconvenient if someone was using the bathroom. The main space of the apartment was very nice and had a larger kitchen than the downstairs. We didn't use this kitchen because we were on the main floor more often and the main deck is off the other part of the house. The kitchen on the main floor is small with very little space for prepping food. There isn't a dishwasher but the hot water is HOT, so the dishes do get sterilized. Might consider bring a pair of rubber gloves for dishes. The living room has a nice big TV for movie nights there is a sectional so for large groups some were sitting on the floor but that wasn't a big deal. Overall the house was fine. It's a rental and most are not perfect the things I pointed out aren't deal breakers. My BIGGEST complaint is the crossing of the M22 to get to the lake. The steps going down have a few nails that need to be pounded in and the kids got a few slivers from the railings. The road crossing is flat out dangerous. It's on a corner and the cars are going 55mph. We didn't cross with out having two adults to spot. There is a guard rail you have to climb over to get to the dock which makes it even worse. The sitting area on the dock could use an update too. The five steps that actually go onto the dock are steep with a rope as the rail??? Still enjoyed our stay but needed to point this out. Five couples. Enjoyed our stay in your house. Great view of lake. Very clean and comfortable. Nous sommes situés à droite sur la route de la ville historique Fishtown à Leland (assurez-vous que vous mangez au Shanty Cheese Village). Dans la région, vous trouverez ... Vignobles, galeries d'art, Pêche, de belles plages, observation des oiseaux, Great Food, et Casinos. Vous serez également une courte distance en voiture à de nombreuses attractions tout au long de l'année, comme le Festival Manitou Music, Leland Food & Wine Festival, Leelanau Conservancy zone naturelle, Excursions vers les îles Manitou, Traverse City Fête de la cerise, Traverse City Film Festival, couchage Bear Park National Dunes, Interlochen Arts Academy Concert Series, automne Tours couleur et le ski.